Whitney Eve Fall 2012 collection, titled "Graphic Kaleidoscope", is inspired by an antique kaleidoscope found at her grandmother's house. 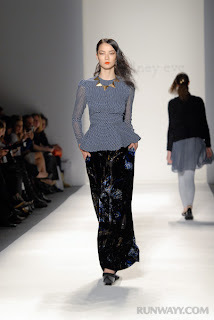 Jewel tones, graphic shapes, mixed prints and florals are seen through mini skirts, peplum blouses and leggings. The collection also includes velvet and sequin pieces. Whitney Port really put her stamp on this collection, as the print minis, leggings and jackets are a part of her signature style.